It's been a long while since I posted. It's been a busy couple months! Between school, home, and designing for some wonderful companies, I'm a little crazy! It's bound to slow down soon. I hope.... Well, at least for the next week, I'll be on "vacation" for Spring Break!!! YAY! The kids will be off and so will I. We plan to play, make stuff, and relax! At least for a few days and then I'm sure I'll be pulling my hair out with trying to figure out what to do with them! So, I'm going to share a little of what has been going on in my world lately. First, I have been featured here and here. The blog, Just Perspective, is one that I found by chance. The owner of the blog, Sue Mylde, is one of the girls that I design with on Pencillines Sketch blog. I was asked to create 3 pages with 3 different words that mean something to me and give me perspective. So, I chose Ability, Communication, and Inscription. I LOVED doing these pages and the canvas that hasn't been shown yet. I used Faber Castell products for the color and am proud to say that I came up with a few new ways to use the Gelatos. One is on this post here at the Faber Castell site. I created these sprays and I have a new post coming up next Tuesday that shows how to make glazes or paints from them! It's a lot of fun! Now on to my work life... I have been so busy with getting work hung up, labeled, teaching, and Open House! We've had 3 artshows in the last 2 months + one BIG fundraising event called Empty Bowls. I wrote about that several posts ago. Well, it was a HUGE success and we raised over $600 for our area Food Bank! So happy that the kids, families, and staff has such a great time. I know I did! 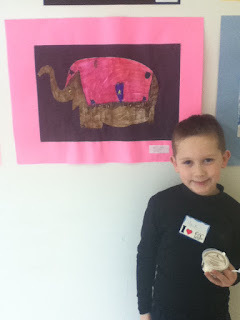 My son at the Empty Bowls event. He's standing in front of the kid's bowls! my bowl for the "celebrity bowl Auction"
My son with his artwork and just a sampling of the over 3000 artworks at the Adventures in the Arts exhibit! Adventures in the Arts was our district wide Elementary showcase of the arts. 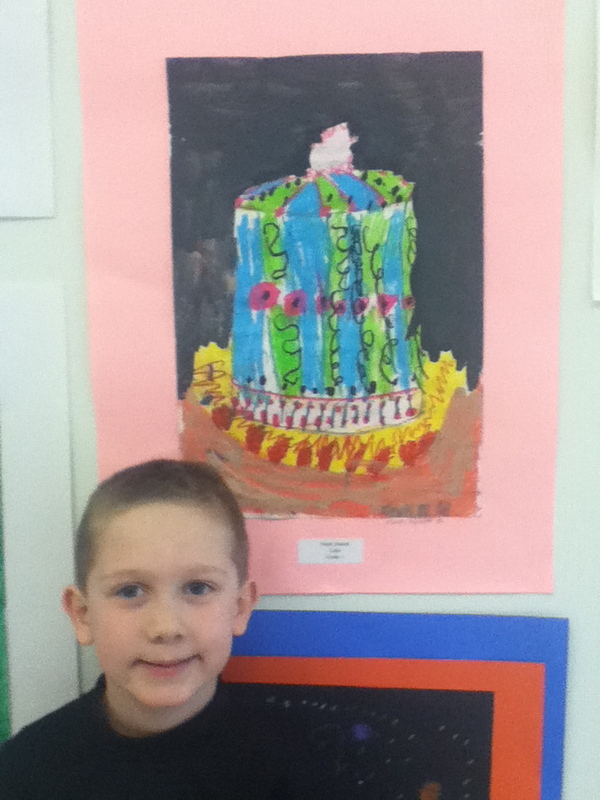 There were over 3000 artworks there from 8 of our Elementary schools! Music concerts were played for the attendees featuring our student bands, orchestras, and chorus. I worked a hand's on activity table making Artist Trading Cards with kids who came to the show. It was fun for all!!! LOTS of work, but a well attended and worth it-kind of tired! 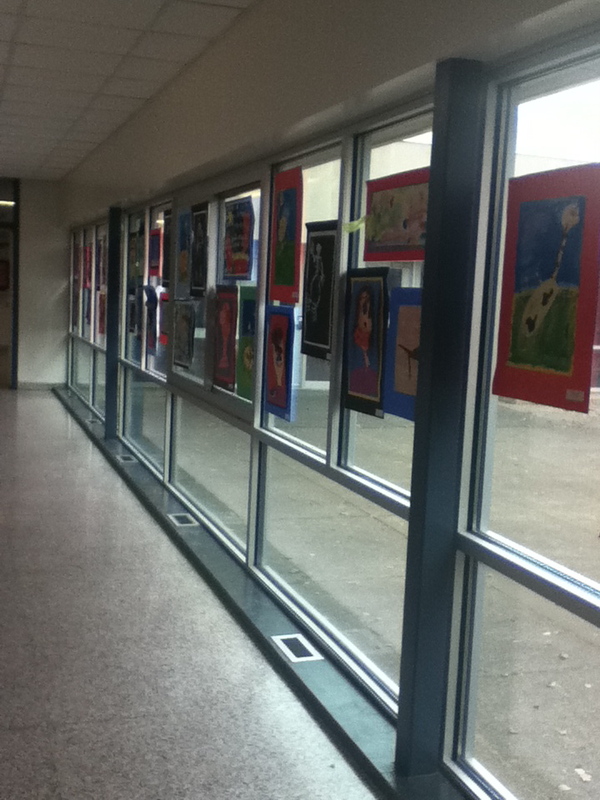 Our Open House was this past Tuesday so here are some photos of the artwork hanging in our halls for the event! I'm so proud to teach the kids in grades Kindergarten through sixth grade here! What fabulous work they do! It makes my job crazy to push them to do this kind of work but LOOK at it! WOW! It's worth it! I'll be posting more work from me later! Have a great week! Jenn these are all soooo amazing! I see modern, classic, use of texture and color galore. I love the bowls and want one! You are such a wonderful art teacher. Kathy G.
Wow! I can't believe I missed this post before! It is an amazing art display. Your son is so cute! Way to go raising money for the food bank. Kids love helping kids it's so amazing. The kids who have the least always end up doing the most for the shows and donations. When they learned about the March of Dimes the kids who have nothing reached in their pockets to give their ice cream money. They wouldn't take no for an answer. You just want to give these kids everything they have such good hearts deep down (even on their worst days!) I'm sure your kids get great fulfillment out of helping others, way to go! P.S. I LOOVE that bowl.